Kids waiting for Sunday School to open at Camp Pell late 1940s. They carried the moral stain of growing up there for years. The inquest into the May 2004 murders of Christine and Terry Hodson is being held in Melbourne this week. The man who ordered their killing Carl Anthony Williams is once again in the public spotlight, perhaps for the last time. It took me a long time, nearly ten years, to fully understand what motivated him. Here was a family that was at odds with the law and the State, but also with the criminal elites that ran the underworld. They seemed to have materialised from the suburban ether, poor white trash from nowhere. But they had risen above the rest of them. There was a streak of rat cunning and resentment in the Williams clan that made them push back against much greater forces. They had built a small empire in the space of a single generation and Carl was fully prepared to slaughter anyone who crossed the family. Their bloody feud with the Moran clan and the rest of the Melbourne big shots was the climax of an untold history. It was about ingrained poverty and disappointment, of generations beaten down, neglected and despised. The descent into crime and murder spoke of what happens to the self-esteem of people when they are denied the opportunity that others regard as a birthright. It’s the bitter realisation that the Australian ethos of the fair go is in fact a cruel joke. It’s the story of what happens when the have-nots finally get a grip on the main chance. The Williams’ journey to infamy began in the squalor of a transit camp for the homeless and destitute on the northern fringe of Melbourne’s Royal Park in the mid-1940s. In the years after World War II, Camp Pell was a human tip for what many regarded as the detritus of Melbourne society. It’s almost forgotten now. It’s a memory that jars with the post-war prosperity story that most Australians learn in schools these days. This place of degradation and suffering has been transformed into an “Urban Camp”, a quiet patch of cultured bushland nestling between busy Flemington Road and the State Hockey Centre. Teenagers come here now for school excursions. Nice people from the affluent adjoining suburbs walk their dogs among the eucalypts and wattles, enjoying the serenity of this oasis in the urban jungle. It seems benign and peaceful. In the 1940s, when Carl’s grandparents on both sides of the family came here it was far from that. Camp Pell was their last resort. It was a choice between this stinking sinkhole or the streets for the Williams and the Denman clans. To George Williams, it seemed that everyone he knew had come from Camp Pell. It was his first memory. And his bride Barbara Denman had been born there too. The sprawling shanty town had begun as a camp for Taskforce 6814, the forces that US Supreme Commander General Douglas MacArthur had thrown together after the Japanese had attacked Pearl Harbour in Hawaii in December 1941. As a military camp, it had been suitably hard and uncomfortable but it was only ever meant to be temporary. The soldiers had stayed in tents or Nissan huts, igloo-shaped iron sweat boxes with dirt floors and no insulation. The place had acquired a sinister reputation almost from the beginning. In the space of two weeks in May 1942, an American serviceman Private Eddie Leonski stationed there had murdered three local women, gaining the sobriquet the Brownout Strangler. On Macarthur’s orders, Leonski was hanged at Pentridge in November 1942 but the scandal cast a morbid shadow over Camp Pell. Later, a rumour swept Melbourne that American military police had shot and killed a number of GIs and some locals who had been involved in a vicious mass brawl outside the Flinders Street Railway Station in December. The story went that the incident was covered up on MacArthur’s orders and the corpses were secretly cremated at Camp Pell and the ashes spread on the grounds. The story was apocryphal but it helped cement public notions that there was something evil about Camp Pell. After the war, the camp was turned into a transit camp for homeless families who moved straight into the Nissan huts the Americans had vacated. It was supposed to be a temporary arrangement for one year while the Victorian Government built new state housing for the poor. However, it stayed open for ten years amid government inaction and growing public revulsion. In 1947, the Building Trades Federation wrote to government saying that living conditions at Camp Pell were “worse than the worst slums in Melbourne.” At any one time, more than three thousand people lived in Camp Pell sharing communal washing and cooking facilities. When it rained, the camp quickly became a quagmire, a dismal playground for hordes of filthy children with no shoes and ragged clothes. In summer the iron huts were intolerably hot so many took to sleeping out in the open. There were frequent outbreaks of diseases like diphtheria and whooping cough, diseases of poverty and overcrowding. Camp Pell kids were ostracised at local schools for being unclean and spreading illness and head lice. Carl’s uncles and aunts even found the teachers gave them a hard time for their ragged dirty appearance. Despite occasional half-hearted attempts to tidy it up, Camp Pell remained “a breeding ground of physical and spiritual disease…an evil intolerable plague spot,” according to an editorial in the Argus newspaper in April 1953. Privately, the State’s leaders could only agree the conditions were disgraceful but there was simply nowhere else to house these poor families. A slum reclamation programme had begun after the war and many families had been displaced from cheap rental accommodation across the inner-city. A wave of middle class migrants from Europe had bought up many of the old tenements in inner- city suburbs like Richmond, Fitzroy, St Kilda and Carlton. The original inhabitants, many of whom had been living there for generations on cheap rent were given their marching orders. There had always been a shortage of housing for the poor in Melbourne but by the late-1940s the situation was dire with evictions running at 100 a month. There was little sympathy for the poor souls forced to live at Camp Pell and a number of other transit camps around the state. It seemed to them that the migrants got a better deal than the poor families of the city, many of whom had sent sons and daughters to fight and die for King and country in the war. While the migrants were praised for their work ethic and family values, the Anglo-Celtic poor were reviled for their moral degeneracy. Barbara’s parents, Bill and Mary Denman were none of those things, just decent hard working folk who left their home in Fish Creek in south Gippsland to look for a life in Melbourne. Bill Denman was a qualified welder but work was scarce and accommodation virtually non-existent so the only alternative was Camp Pell. With a growing brood of children, they tried to make the best of what they hoped would be a short stay. They stayed for nearly five years until they had seven children crammed into their iron hut. George’s family had lived a few rows away from the Denmans with his mother, two sisters and a brother. George’s father had been a wharfie though he spent little time with the family. In fact George was not sure that the man was even his father. “You only know your mother for sure don’t you,” he liked to say later. Despite this George had fond memories of Camp Pell. It was a hard life but they were together, sharing the hut with its dirt floor, huddling around the saw dust burner for warmth in winter and sweltering under the tin roof in summer. Yet the camp was an extremely dangerous place for adults, especially under the seething smoky cover of night. The newspaper archives are full of stories of murders, robberies, rapes and domestic violence that were commonplace at Camp Pell. Police regarded the camp as the epicentre of crime in Melbourne. But the kids generally were exempt from these horrors and, as kids do, adapted to life in the mud and filth. George Williams remembered nights roaming the grounds with other kids, seeing groups of men drinking around late night fires and hearing their stories. By 1953, there were 1300 children under 16, like George Williams and Barbara Denman living at Camp Pell. There were fears that “this evil pernicious place” might poison its inhabitants and the city in general. In 1953 The Argus mounted a strident campaign to have the camp demolished. “First the camp holds many hundreds of decent, hardworking men and their families, who want homes but can’t get them. The social consequences of the moral contagion that had flourished in Camp Pell would be felt later, the newspaper warned. Families in the adjoining areas would warn their kids to stay out of Camp Pell as if the contagion of poverty could somehow be transmitted by contact with “the inmates” as the residents were described as if they lived in a jail or an asylum for the insane. “Every suburb has its undesirables – even Toorak” one resident, AF Gelsi told The Argus. “But 99 per cent of residents at Cam Pell are good clean families who care for their homes and their families and behave as well as anyone,” he said. Some families seemed content to stay in the camp indefinitely. “I have lived here for two years and spent more than £400 on furniture,” said a widow, Mrs EM Stanley who was raising a 13-year old daughter. “There are hundreds of other families here who have done the same,” she said. In July 1955, the Labor Government of John Cain issued mass eviction notices to the residents without any plan of how to re-house them. With the Olympic Games coming to Melbourne the following year, the State Government had built 800 houses for the competitors in the Games Village but apparently could not find any funds to accommodate the residents of Camp Pell. Instead the residents had been told to move their belongings out as soon as possible so the decrepit hovels could be razed. The indignity of their treatment welded the people into mass action. Protest meetings were held to complain of the inhumane treatment. “No self-respecting person wants to live in this filth and squalor but most of us have to,” the chairman of the Emergency Housing Tenant committee told a meeting of residents. “As he addressed the open air meeting children played in pools of mud and slush,” the Argus reported. “This is what we have to put up with,” said Mr AA Black, a member of the committee said his eyes sweeping the scene. When the authorities came to forcibly evict residents, members of the Communist Party and trade unions helped families stand their ground, wresting back furniture and personal belongings and returning them into the huts. Eventually sense prevailed and the camp was given a reprieve while government worked out what to do with the 600 families who stubbornly refused to move until offered proper housing. Despite all the outrage there was still nowhere to put these destitute people who seemed to threaten the moral health of the city. In 1955 Liberal Party leader Henry Bolte came to power and vowed to put an end to Camp Pell as one of his top election promises. 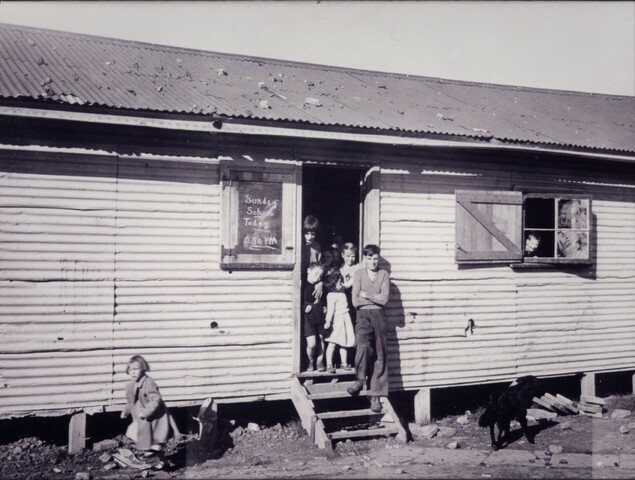 The last family left Camp Pell on May 31 1956, giving the Public Works Department enough time to clear away the remaining 50 huts before the Olympic Games came to Melbourne in November. It was not from a sense of pity or compassion. Bolte privately said that he could not allow Queen Elizabeth and husband Prince Phillip to gaze upon the filthy eyesore as they came in from the airport to open the Olympic Games. The Denmans had already left Camp Pell in 1954 when Barbara was six but George’s family had been among the last to vacate. Most families had been shifted to Housing Commission dwellings while others had found their own housing. George’s family had ended up in a rundown worker’s cottage in North Richmond that was only marginally better than the hovel they had left in Camp Pell. But families who had lived at Camp Pell could never remove the stain, at least in the eyes of the good middle class folk of Melbourne. While they abhorred the conditions and castigated the government for its inaction there was a sense that the people living in Camp Pell were beyond redemption. Soon the chickens would come home to roost in the form of crime and social dysfunction. The vermin would infect the city. “We hear of marriages breaking, men turning to crime, children becoming tough young dead-end delinquents under the ugly spell of Camp Pell,” one editorialist thundered. “Carl Williams is dead and believe me the world is better for his passing. It’s one more vote for a cleaner Australia. He was scum and don’t let TV shows like Underbelly ever fool you otherwise,” he said. How laughable it was that Hinch and others could wish away half a century of social exclusion with the death of one man. There were thousands of people who recognised their own lives in Carl’s story. To them, it was hardly surprising that Carl had put family before the law or society’s norms. Excellent entry. I hadn’t thought of Williams in this light. It’s wonderful to see longer entries reappearing. Hi Adam, the research you have undertaken for your latest piece is remarkable. Thank you. There will be those of course who may skim the lines and read it as condoning the breaking of laws through understanding. As you have noted in the past, understanding is far more valuable than judgement – which an increasingly enlightened world is beginning to acknowledge as the most useless of human behavior. Kind regards to you and yours Sonia. I have to confess the post is an excerpt from my latest book Carl Williams. I started out with the aim of doing a short promo for the book and then suddenly the whole chapter was in there! But yes the media is usually quick to apply moral judgements to people without considering what the wider deeper context is. Guess I now buy the book:) S.
Dear Sir I read with great interest your story on that terrible place called Camp Pell. i was a young lad of 15 summers when as a young apprentice butcher living in Rathdowne Street In Carlton I would have to deliver meat over to that notorious,terrible place & to me then it was normal for these people to live there , where i lived wasn’t much better it was 1 of 4 terraced cottages in an area that was bounded rathdowne st. princes st lygon st & neill st.we did not know then that after we left in 1952 that whole area by the 1960’s lo & behold was bull dozed & up rose the slums of the future namely high rise density living all over that area aforementioned & how long did those last ? till the 2000’s & again a new lot of more modern looking structures that have improved that part of Carlton no end & more livable part of Melbourne has arisen & pleasing to the eye big improvement since i lived there all those years ago ! Regards Old Carltonite. Fires were common in Camp Pell. The cause was the heaters in the centre of the loungeroom. Lit logs would fall onto the wooden floor and we would scramble to replace it before a fire started. Once they started moving people to commission houses fires were seen as a way to jump the queue. As a journalist and a writer, I try to speak first-hand to those with a story to tell or an opinion to share. It fills my life with opportunities to learn. It’s not always easy, but I feel richly rewarded by the fine people it has brought me into contact with all over the world. My hero in journalism has always been Jules Francois Archibald, the first editor of The Bulletin magazine, where I had the privilege to work until its sad demise in 2008. Archibald told a young contributor AB “Banjo” Paterson that, as a reporter, it was easy to get by singing in the chorus. In a group of voices, the individual could conceal doubt and lack of conviction. But singing the “descant” (defined as a single voice that counterpoints the rest) was a more difficult and demanding thing to do, but ultimately it was the essence of good journalism. This space is all about celebrating that idea.